My Aunt Jean used to tell me, while feeding me split pea soup for lunch as a child, “It will put hair on your chest”, a metaphor for making me grow up big, strong and healthy. Only now do I realize what ancient wisdom she was imparting to me at my young age. Pea flour has been manufactured and sold through a few small producers for some years, albeit somewhat unsuccessfully. Lack of consumer education and insufficient known ways to use the product made for limited sales. When I heard about what Churchill Global International is doing with pea flour, I was compelled to research the current availability, usage and health value of any pea flour thoroughly, for myself. In my search to find pea flour for my recipes I found brands of green pea flour online, though not a single yellow pea flour. I could not find any pea flour sold in any store in New York City, a city where you can find practically every food item or ingredient from anywhere in the world. Even online, Bob’s Red Mill website was out of stock. Further online searches revealed that Barry Farm offered green pea flour for $7.25 a pound with a shipping fee of $10.75. As a chef and food stylist, my biggest obstacle for using their expensive pea flour for my recipes is that green pea flour would make an unsightly and unappetizing looking meal. Churchill Global’s yellow pea flour is made from non-GMO organically and sustainably grown peas from their veganic farm. Then sprouted and dried, the split yellow peas are milled into pea flour and pea protein powder. What is a veganic farm and why sprout the peas before milling? A veganic farm uses no chemicals, and houses no livestock. If peas touch the soil where animal manure is present, they are susceptible to contamination from Hemorrhagic Escherichia Coli, Salmonella and Listeria. Cleator Farms is listed as a veganic farm by One Degree Organics. There are always some chemicals almost anywhere you farm, due to rainfall, spray drift from outside sources, and birds flying overhead. The use of shelter-belts (wind breaks such as trees) and rotation management minimizes the contamination. One principle cause of contaminates on most other farms in North America is glyphosate (Round-up from Monsanto is one example). Cleator Farms boast an extremely low level of chemicals, especially glyphosate, on their land. Their levels of glyphosate are consistently measured to be 5 parts per billion. The permitted level in Canada is 5 parts per million. The US tolerance is 30 parts per million. Why is the use of sprouted peas and grains important to health and nutrition? You may have seen a variety of sprouted grain breads and baked products in the market over the last two decades. It has long been known that sprouting legumes, grains, nuts and seeds increases their digestibility in the human body. Sprouting is described as a pre-digestive step. The benefits of using sprouted peas before drying and milling are many fold. Churchill Global International eliminates any danger of post sprouting bacterial contamination, which can be responsible for food poisoning. One method by which this is achieved is using US manufactured equipment to sprout and dry the pea flour, all in one machine. This is an important safety step in processing any sprouted product. In searching for a superior choice of super food infused goodness for my exquisite Sweet Potato Pecan Pancake recipe, I found much more than I had bargained for. I found a pea flour education. I also found that Churchill Global’s yellow pea flour is not yet on the market for retail sale, but they hope to have it available in the future. I wrote to Mr. Winston and asked him if I could get samples in order to test my pancake recipe. I am happy to present to you a photo of the fruits of my quest. My recipe for Sweet Potato Pecan Pea Flour Pancakes with a Maple Yogurt Goat Cheese Sauce is graced with just the right amount of sweetness to tickle your fancy. It has lots of fiber and nutrients from the delicious wholesome ingredients and makes an impressive presentation when topped with your favorite fruits. In a large bowl whisk together all the wet ingredients until well combined. In a second bowl, sift together the dry ingredients except the nuts. Stir the nuts into the sifted dry ingredients. Heat the pan or griddle on medium heat, lightly brushing with oil between pancakes. Cook for 3-4 minutes until the bottom of the batter seems browned and firm. Flip the pancakes and cook for them for another 3-4 minutes. Repeat with the rest of batter. Whisk all the ingredients together until smooth and satiny. Serve the pancakes topped with the sauce. Top each dish with fruit and sprinkle with the reserved nuts. 1. Keep the finished pancakes in a 200 degree F oven while finishing the rest. 2. Thin the sauce with warm water or nut milk if desired. and plums for topping the pancakes. If you cannot get pea flour you can substitute 1 1/2 cups red fife wheat flour or all-purpose flour for the pea flour and rice flour combination. Cod is one of several seafoods, many shellfish included, that has only 30 calories per ounce. It is rich in omega 3’s and is an extremely good source of protein. It is light and flaky, and highly flavorful with a delicately creamy mouth feel. It is easily procured at a fairly low cost, ($9/lb.) is wild caught, and is relatively free of mercury and toxins. It is highly versatile for recipes and has provided nutrition worldwide for centuries. I came up with a recipe that uses olive oil in place of butter. It is rich and flavorful, with less than half the calories of a traditional Beurre Blanc. More flavor, less calories, more satisfaction, less cravings…This is my mission. My recipe for Cod alla Vin Blanc (alias Cod Beurre Blanc alla Olive Oil) combines these two loves of my life, with some change ups. It is an easy and fast one pan rendition, that is both healthy and calorie conscience, while being seductive to the eyes. In a non stick, non coated skillet with a fitted lid, add in all of the ingredients, laying in the cod filet last. Put the lid on. Heat the pan to medium until it starts to boil. Reduce the heat as necessary to make the boil moderate. As the liquid steams the fish, bast it occasionally with a spoon throughout the cooking process, about 7 minutes, depending on the thickness of the fish filet. Carefully check it with a fork in the center to make sure it is just cooked. The cod fish will flower into wonderful flakiness as it steams. Do not over cook the fish or it will become rubbery and tasteless. With a slotted spatula, remove the fish from the pan, draining it as well as you can from the liquid, onto a the serving plate. Continue to cook the liquid in the pan until it becomes a syrupy sauce texture in thickness, if it is not already. Serve the sauce over the fish. Enjoy it with a good glass of white wine. 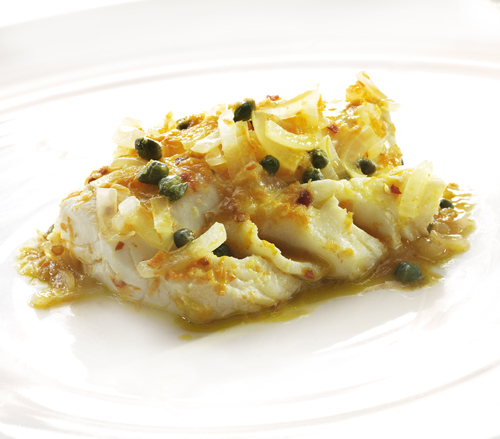 There is no need for additional garnish as the ingredients make a spectacular look on the flowered flaky cod. The flavor is amazing. I have loved asparagus since I was a small child. My mother served it often with butter and salt & pepper. In my adult years, upon discovering shallots and the wonders of fresh lemon juice and zest , I have been making my recipe for Asparagus with Shallots and Lemon for many years. The first time I took a plate of this dish to a neighborhood buffet dinner party, the plate was emptied immediately. People were asking me for the recipe because they loved it so much. I went back home and made another platter of it to bring back to the party. Mine was the only vegetable dish, aside from a green salad, the others being popular heavy meat, cheese and starch foods. I was delighted with my recipe’s reception. Asparagus, with it’s delicate flavor and tender succulent flesh, has been prized as a delicacy since ancient times, especially in Ancient Egypt, Rome and Greece, and was and still is known for its cleansing and healing properties. Asparagus has often appeared in high brow recipes such as Asparagus alla Hollandaise, though in modern times has become ubiquitous in food markets and is easily procured at modest means. It is a pantheon of health foods with high fiber and nutrients, and has a low calorie count of 36 calories per cup. It can be useful both as cure and preventative for disease. Other experts agree that asparagus is high in antioxidants and amino acids, has little fat and high protein, is low in sodium and is a diuretic. Furthermore, it is also a great source for: calcium, magnesium, zinc, folic acid, thiamin, riboflavin, rutin, niacine, glutathione, (http://www.doctoroz.com/videos/superhero-antioxidants-pt-1, http://www.amazing-glutathione.com/what-foods-have-glutathione. html, http://www.effectsofglutathione.com/), iron, phosphorus, potassium, copper, manganese, selenium, and chromium, “a trace mineral that enhances the ability of insulin to transport glucose from the bloodstream into cells.” (http://en.wikipedia.org/wiki/Asparagus) This last tidbit is especially useful for diabetics. Asparagus is especially known to cleanse the liver and kidneys It is also found to help cure gout by dissolving uric acid in the the extremities, and help in bowel evacuation. Water from cooking asparagus is considered to alleviate facial blemishes. There is much scientific research on the matter of how asparagus makes your pee odorous. After having read them all I still believe that it is it’s property of cleansing the liver and kidneys that causes the phenomenon. Asparagus simply makes your pee smell because it releases the accumulated toxins from your body. 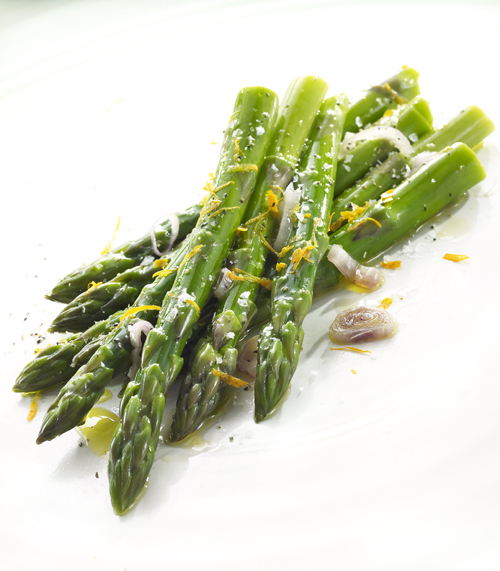 I share with you here my recipe for Asparagus with Shallots and Lemon. I lemon, zested and juiced, zest is 3 calories per Tablespoon, juice is 8- 10 calories for 1.75 ounces. I used a Meyers lemon for the rich color and sweeter taste. Remove the asparagus from the boiling water and place into the ice bath to preserve the bright green color. Drain and dry them thoroughly just before the finished cooking process. In a skillet amply sized to accommodate all of the asparagus single file, saute the shallots in the olive oil on medium low heat until slightly golden brown. Add into the skillet the drained and dried asparagus and stir to coat them with the oil and shallots. Add into the skillet the lemon juice and half of the lemon zest and continue to cook for a few minutes, tossing all the while. The juices and oil will emulsify to form a glaze. Remove everything to a plate with tongs and season with flaked sea salt and freshly ground pepper to taste. Garnish with the rest of the lemon zest. Serve and enjoy as a side dish with your favorite entree and whole grain, or add to a salad.